I guess I’m not 100% sure how to feel about Philomena. It’s the kind of movie that I would feel guilty for not liking because it’s based on a true story and has good performances. But still, I feel sort of blah about it. 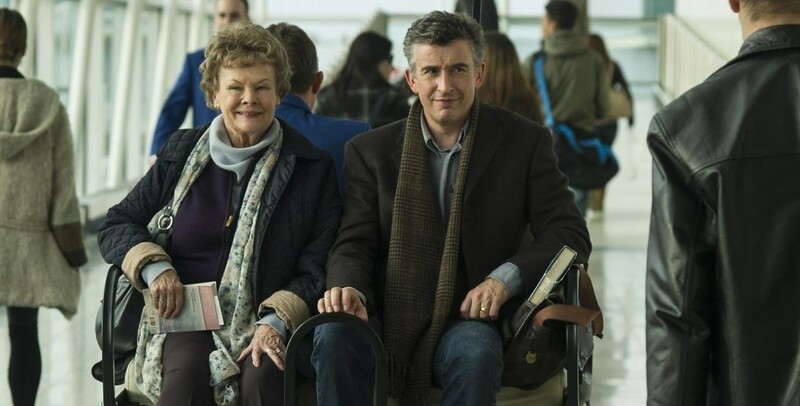 The story of Philomena is fairly tragic, and although it did happen, seems overly sappy at times. Philomena (Judi Dench) was sent to a convent as a teenager because she was pregnant. After giving birth, she was forced into hard labor there as payment for staying. While she was there, the nuns adopted out her son without telling her. Fast forward to old lady Philomena, who tells her story to Martin (Steve Coogan), a writer who sets out to help her find her son. Turns out the son was an American who had died 9 years before of AIDS. They then find out that he had tried to find his birth mother and went back to the convent, where the nuns told him that Philomena had abandoned him and they didn’t know where she was, even though she checked in with the nuns every few years. They also find out he’s buried in the convent’s cemetery. The end!! I guess the biggest problem I had with the story is why we were supposed to care so much about this particular person. They repeatedly say that Philomena spent her whole life searching for her son, but in the beginning we see her tell her daughter about the existence of her son for the first time, some 50 years later. So she did go back to the convent to try to get their help to look for them, but saying she spent her whole life looking for him seems far fetched. He was a senior official for the Reagan and first Bush administrations. Would he have been that hard to track down? The movie takes place in present day, sooooo there’s the internet and all. I don’t know, I guess I just wasn’t that convinced. It’s a sad story but I just wasn’t really that interested. I wasn’t sure what to expect when I saw this movie but I think in the end I was mostly bored. I left this movie asking too many questions. Namely, why was this made into a movie. I enjoyed most of the story but I ended up feeling like it was just a bunch of crazy coincidences. I didn’t really care too much about Philomina the person. I would say, if you’re interested, watch this, but there were way too many other incredible movies that came out in 2013 to watch first.